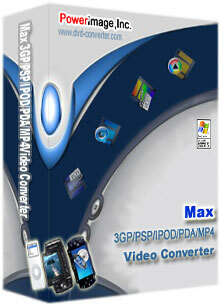 Max IPOD 3GP PSP PDA MP4 Video Converter is ideal software. With it strongest compatibility, which integrate almost popular Video to IPOD, Video to 3GP, Video to PSP, video to PDA, video to MP4 formats into one version．Max IPOD 3GP PSP PDA MP4 Video Converter enables you to convert AVI (DivX, XviD...), WMV/ASF, MOV (QuickTime), MPEG (MPEG-1, MPEG-2), MPG, WMA, DAT, MP4, 3GP…to IPOD 3GP PSP PDA MP4 formats and support convert Video to iPod Video to 3GP, Video to PSP, video to PDA, video to MP4 directly all the operation just one click. Support Input file format of MP4 MOV to PSP 3GP PPS IPOD PDA MP4.